Back on in October I wrote about the potential branch-level fallout in the Bronx from the acquisition of Washington Mutual by JPMorgan Chase. I was able to identify 12 different sites across the borough where a Chase and WaMu branch were in very close proximity (see map). After trying to find out which branches would actually shut their doors through the bank’s regulator (the Office of the Comptroller of the Currency in this case), I was informed banks don’t even need to notify their own customers (let alone the public or the regulator) if a branch closing is due to a merger or acquisition. Seeing how most branch closings are for this reason, the regulation seems mostly useless. Fortunately, through our friends at the Association for Neighborhood and Housing Development (ANHD), we’ve heard back directly from Chase regarding the closings. Apparently, the Bronx will lose 8 bank branches in the coming year due to this acquisition. 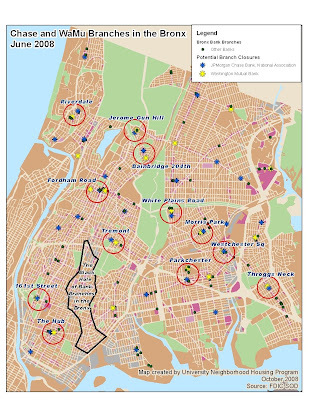 While none of these closings will leave any neighborhood branchless, it will mean the bank to household ratio in the Bronx will get even worse (can the lines get any longer?). Let’s hope that other banks take over some of these soon-to-be-vacant branch sites. If you bank at one of these branches, you've probably already been contacted by Chase. If you are looking for a new bank branch, you'll probably want to avoid these locations. Chase is mailing information to all affected customers about the nearest branch that can help them. We also will hand out similar information inside each branch. When making the consolidation decisions, Chase considered many factors, such as nearby branches, customer traffic at the branches, and whether a branch’s customers walked, took public transit or drove there. By the end of 2009, all former WaMu customers can conduct their business at any of 5,000 branches. At that point, all the branches will be branded Chase and both Chase and WaMu customers will have access to more branches than they do today. Customers already can withdraw cash or check their account balances without a fee at any of 14,000 Chase or WaMu ATMs around the country. equipped Chase -- that can help them. 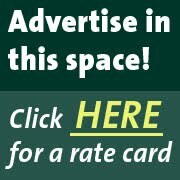 By January 27, customers could find out quickly whether a WaMu branch was affected by going to wamu.com, clicking on “Locations” and entering their WaMu branch location. Chase branches will not be able to serve WaMu customers until systems are combined later this year, except where otherwise noted. Nice work, Greg. Thanks for sharing this critical information.